Memory or RAM bandwidth test. Hard disk drive data transfer rate. CPU or Processor details like CPU family, model, stepping, CPU speed, number of cores and supported instruction sets. Amount of RAM that is installed in the computer. This tool does not require any installation hence can be used in portable drives and moreover it weighs only 80KB. 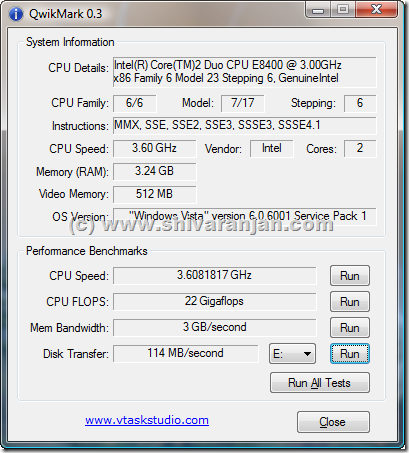 Though this software cannot be used for detailed benchmarks but as the name suggests that it is a tool that is intended to be used for quick benchmarking. blog. It seems like some of the text within your posts are running off the screen. Can somebody else please comment and let me know if this is happening to them too? keep sharing such a wonderful information. keep it up…………..